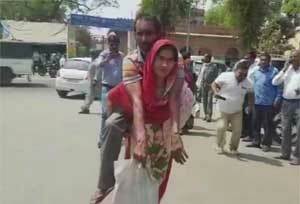 MATHURA: In a disheartening incident, a woman was seen carrying her differently-abled husband on her shoulders to obtain a disability certificate from the CMO office. Vimala’s husband was a truck driver, who, due to some medical problems, had to get his leg amputated a few months ago. When she went to the CMO office to get her husband’s disability certificate made, Vimala was asked to get his photograph clicked. Because of the lack of a tricycle, she was forced to carry her husband on her back. “We have no access to a wheel-chair or a tricycle. We went to many different offices but still have not got the certificate,” Vimala told the media. What a pity..?Why can\’t they send someone to her house instead?Too difficult for the govt?